Aside from kitchen knife blades, research and development in kitchen knife handles are also advancing, with the utilization of different materials such as wood, resin, stainless steel, micarta and staghorn for a knife’s handle depending on the knife’s use. 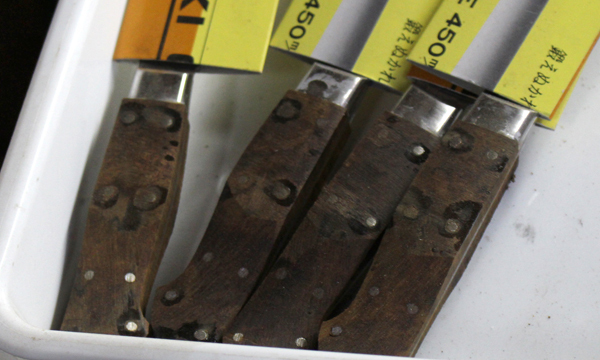 Among Sakai Takayuki knives in the market, the handles of knives with the inscription “Sugihara handle” are all hand-made by Mr. Keido Sugihara. 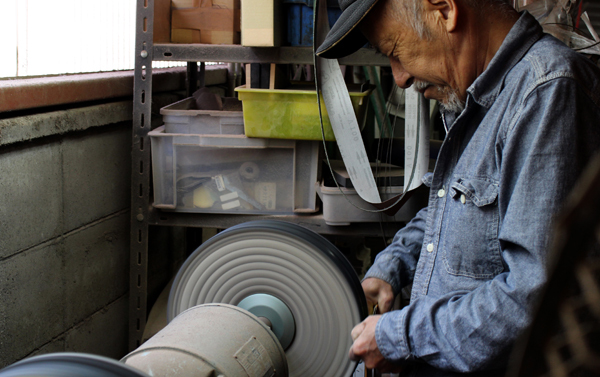 Mr. Sugihara is also well-known as a master in mountain stream fishing. 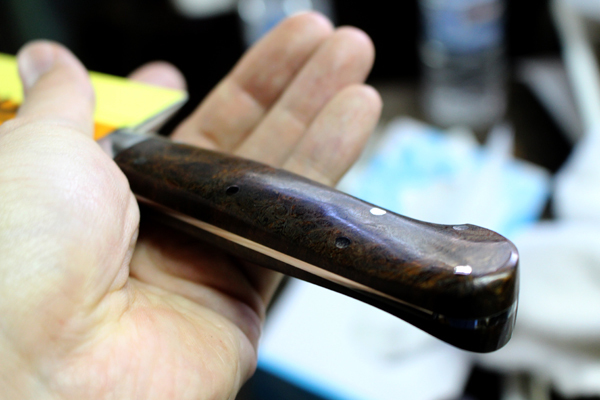 He chose to be a custom knife craftsman after the idea of making his own knives came to him while using knives to clean the fish that he caught. In the beginning, he studied the knives of world-renowned custom knife makers, and began producing his own by copying those knives. 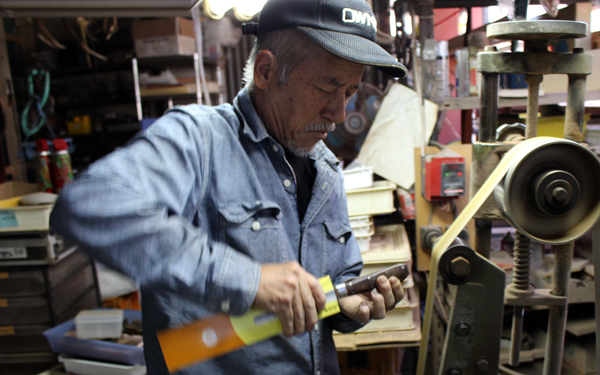 Since then, he has been making all kinds of custom knives and kitchen knives for more than 30 years. 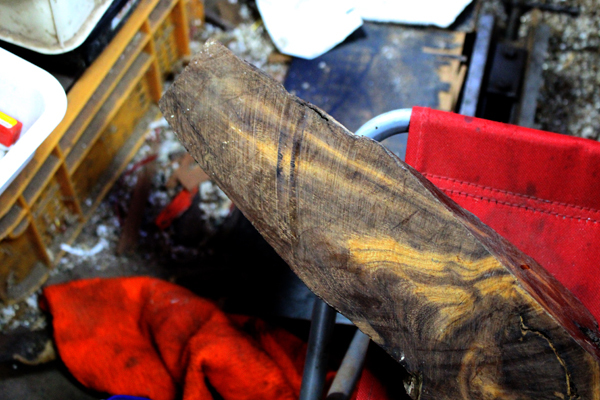 He uses “desert iron wood,” a first-rate wooden material. 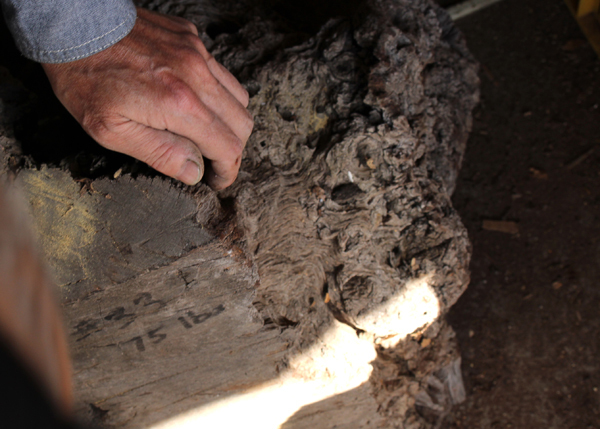 This wood is sourced in an area between the United States and Mexico, and it is a fossil-like ancient wood that has been buried in the desert for thousands of years. Compared to other wooden materials, it is predominantly hard, does not deteriorate during long-term use, and is also water-resistant. It is a top-notch wood with a beautiful sheen and grain, and it is used in fountain pens, musical instruments, and in the handles of fine knives. Because of its recent popularity, it has become difficult to procure this high-quality material. We were allowed to shoot part of the production process so please take a look. This wood is very dense, so it is also very heavy. 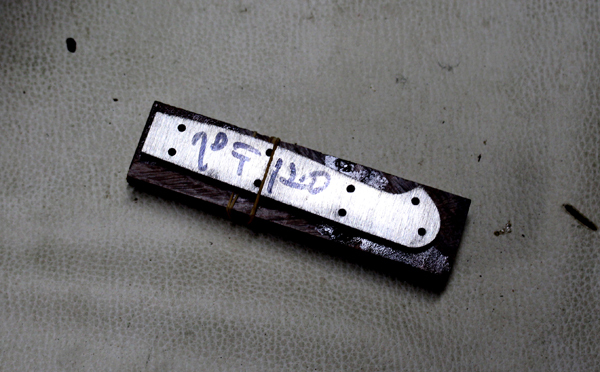 The wood is cut in the shape of a handle, and after the wood is roughly formed into a handle, the wooden base and the handle (metal) part of the knife are fused together using an elastic adhesive and pins that are inserted into 8 holes bored into the wood and metal. Because the wood is very hard, it is difficult to process it. But according to Mr. Sugihara, this is precisely why it is worth doing, and he looks forward to finishing the knives each time. 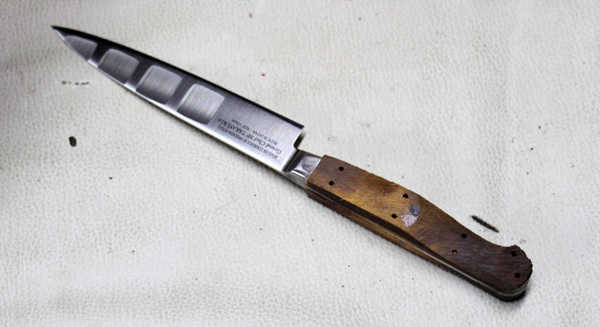 After this process, the handle is polished several times using a grinder and a buffing machine for the finishing process. With an attention to detail in its design and a curved surface that was devised for easy handling, the handle is easy to grip, durable, water-resistant, and has a beautiful grain.